Union elections were to be held in the world biggest democracy this year 2014 when out of 120 crore Indians, 81.4 crore were eligible voters in which there were 10 crore new voters. Over 5000 candidates represented 84 political parties, fought for 543 seats to lead the democracy and run the country. More than 563 million Indian citizens were involved in the formation of the new government and cast their votes in the elections. Times Now wanted to capture this historic moment and present it to larger audience covering an every element related with the elections such as what the people were thinking and opining about the elections, so as to have a more impactful transmission of inter-citizen messages and views throughout the country to benefit the Indian democracy in having the best possible government. Times Now is a 24-hour English news channel based in Mumbai and broadcast in India, Singapore and USA. Arnab Goswami is the Editor-in Chief and Sunil Lulla is the current CEO. It was the first news channel in India to be launched on mobile screens (Reliance Infocomm Network). 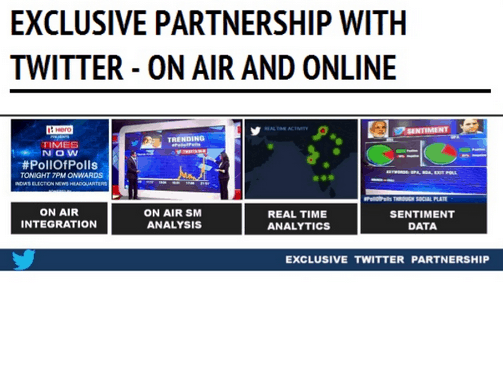 • Twitter was used to reach out to the target audiences since, as an English News channel, Times Now has a huge audience overlap with this particular social media platform. 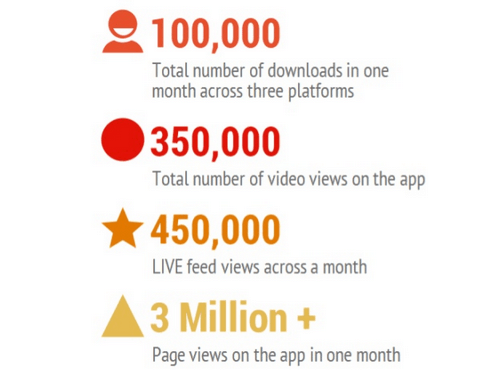 Social media was used to amplify the impact of the campaign driven by the television. On air components were created with the help of Twitter sentiments, seamlessly creating cross platform content integration. 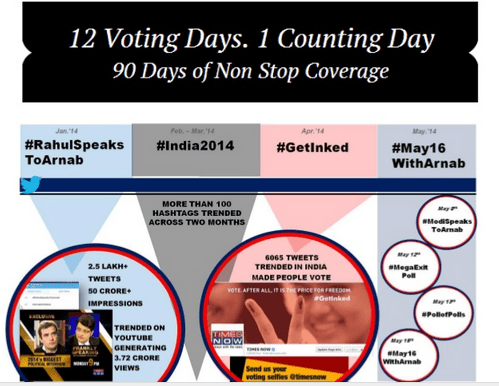 A huge buzz was created on Twitter across the counting week from May 8th onwards with hashtags like #MegaExitPolls, #PollofPolls, #ModiSpeaksToArnab, #May16WithArnab, #Results2014, #TimesNowatTimesSquare and #Modiat7RCR trending in India & Worldwide, which was achieved through a mix of pre event seeding and conversation drivers. For example, for the Modi interview, Times Now had less than twelve hours to create a buzz since the story broke in the morning and the airing was in the evening. So they made sure that enough conversation happened around the hashtag by creating vines from the episode to build anticipation, using images and quotes; and pushing out tune in reminders. Also, on the 15th, to create brand recall and drive viewership, they ran a contest asking people to tell us their views on the issues which would be addressed on counting day. 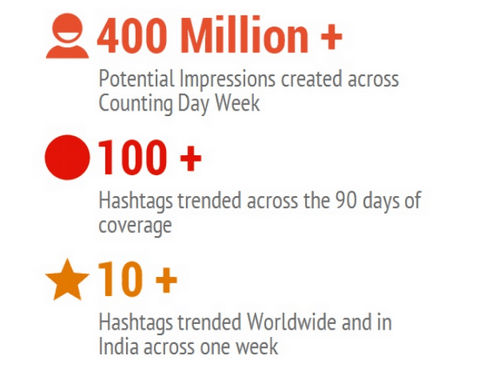 The contest got massive response with the hashtag #May16WithArnab trending worldwide for both the days. Across the campaign they concentrated on coining hashtags which were simple to use, easy to insert in conversations and most importantly were relevant to the news of the day. 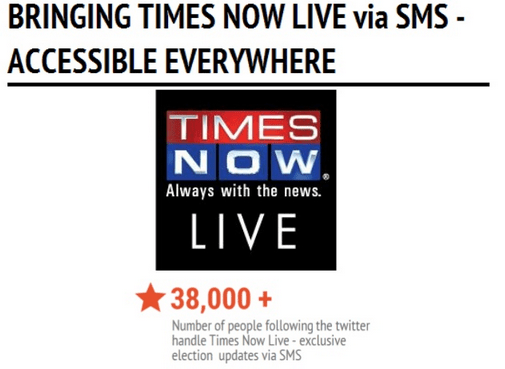 Times Now also twitter updates accessible to people via SMS through the TimesNowLive handle for all major events like exit polls, counting days and government formation. 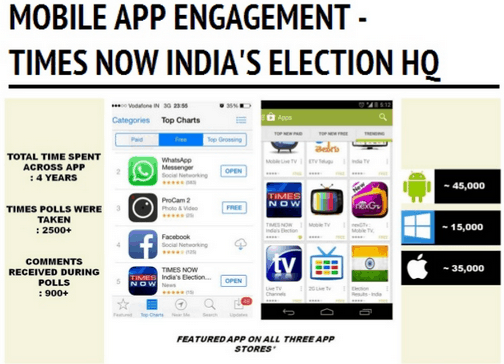 An exclusive election app was launched by Times Now in order to bring live feed and video content of all the election programming while giving viewers a chance to interact with each other and the channel. An immersive second screen experience was created for the viewers of Times Now through this that led to a large amount of engagement. They also made the election coverage available on Youtube as a Live feed and a part of the election hub created by Google especially for the event. Also, to promote stand alone events like interviews, breaking news etc vine videos were strategically used throughout the campaign. Across six days there were more than 10 hashtags trending worldwide with #Results2014 and #May16WithArnab both being top trends worldwide for both 15th and 16th May. 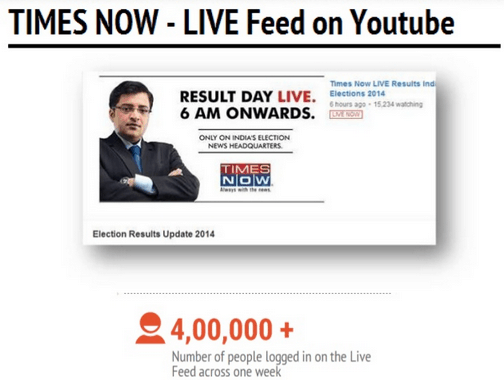 #Results2014 and #May16WithArnab both were top trends worldwide for both 15th and 16th May. 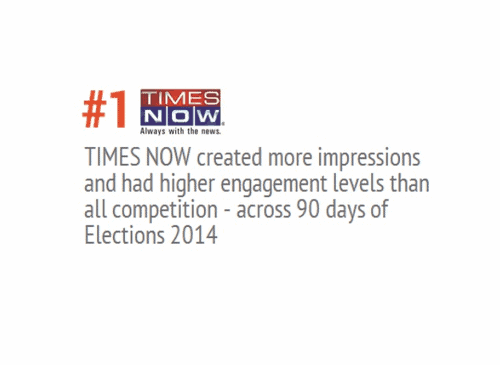 • Times Now itself garnered more than 3.8 lakh followers across the campaign period.